On the first day of AALS, while waiting for the hotel to send up an Internet cord (stranded, without an Internet hook-up! ), I saw Oprah plug a certain book. On Monday, I saw the book at Target, and I bought it. By the time I got home, the Internet was abuzz with the fact that the book, a huge bestseller, is a fraud. 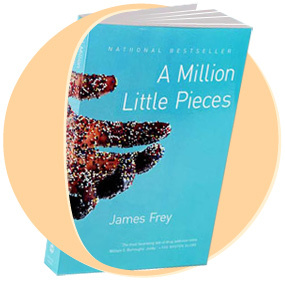 The book, of course, is A Million Little Pieces by James Frey. Although the book was marketed as a "memoir" of Mr. Frey's rehabilitation and redemption from drug and alcohol addiction, he has now admitted that small parts of the book were fabricated, leaving readers to wonder what other parts were fabricated. But, I'm still in the middle of the book. Why do we love these books? This book is virtually identical to Augusten Burroughs' Dry, which I'm sure is virtually identical to other memoirs of individuals who recovered from addictions. I don't think it's because we love the redemption story. I think it's because we love the fall. After the memoirist fully recovers (in the book), the book gets boring and ends very soon, unless there is a relapse. The fall, however, is interesting. I think Mr. Frey knows this, which is why he exaggerated some of the facts of his fall. And of course now, Mr. Frey is providing us the opportunity to relish in his second fall. Of course, what I really want to know is did he really have a double root canal without any kind of anesthesia/painkiller while he was in rehab? That stretches my already suspended disbelief. I'm glad he didn't need an emergency appendectomy.